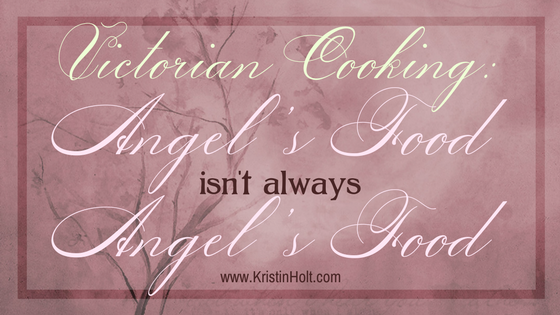 In my most recent post, I shared dozens of historic Angel (or Angel’s) Food Cake Recipes. They’re virtually identical to today’s! Each uses egg whites, whipped to stiff peaks, for both the fine texture and leavening action (no chemical leavening agents, e.g., baking powder or baking soda). 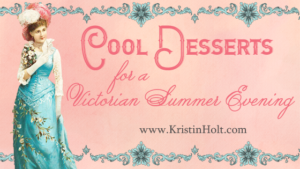 Angel’s Food–A New Dish (custard, sliced cake, apple jelly, icing…) Sounds angelic… and quite a bit like “Trifle”…. 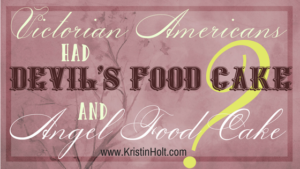 but far from what we know as Angel’s Food Cake. 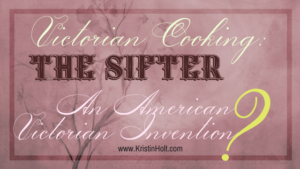 Published in Our New Cook Book and Household Receipts, 1883. 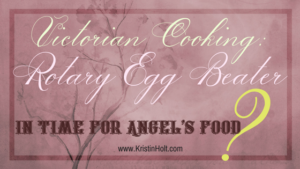 “Angel’s Food”, a recipe made with boxed (plain) gelatine, milk, egg yolks (yelks), lemon to make a custard. Whipped egg whites are stirred in, then the custard is set in a traditional custard mould. Angelic! 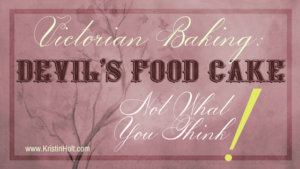 But not the traditional “Angel’s Food” Cake we think of, when we hear the name. 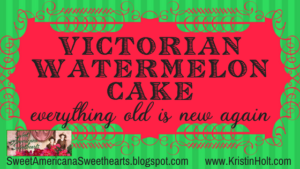 Published in Royal Baker Pastry Cook, midst many cake recipes, in 1888. 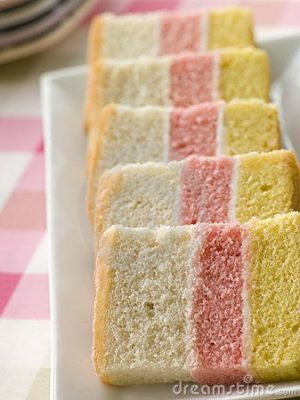 Angel Cake, with three pastel layers. Image: Pinterest. 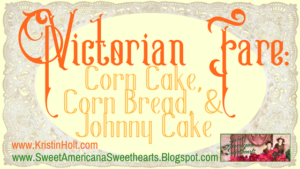 Angel cake (or Angel food cake (not to be confused with American Angel food cake)) is a type of layered sponge cake dessert that originated in the United Kingdom, and first became popular in the late 19th century. 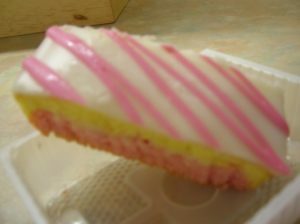 Angel Cake Slice, Copyright © Chellbie from UK & USA. Image: Wikipedia. 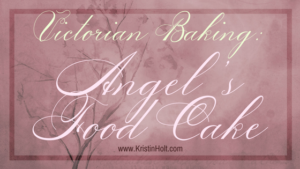 Angel Cookies–essentially Angel Food Cake in cookie form. 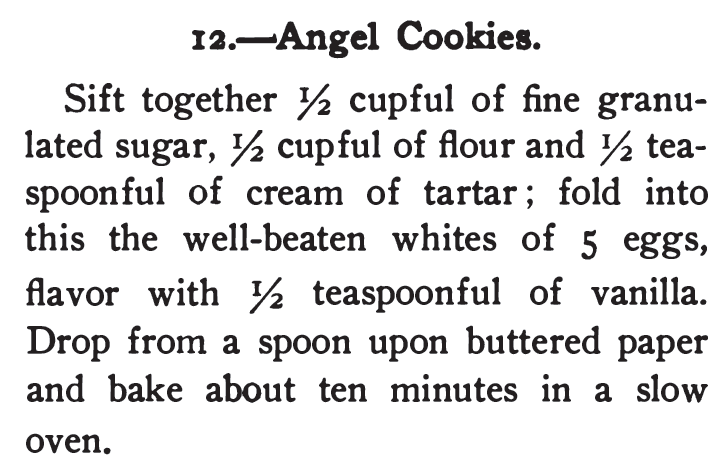 Published in 365 Cakes and Cookies, in 1904. 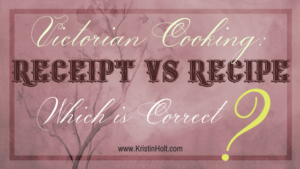 Victorian Cooking: Receipt vs Recipe ~ Which is Correct?